What's a FREE and SAFE Way to Turn YouTube into MP3? Find a beautiful song in YouTube, and want to download and convert the YouTube music video to MP3 for putting it on your iPod Touch or other devices? Want to extract MP3 file from a YouTube lecture video? YouTubers often need to convert YouTube video to MP3 audio for a variety of reasons. But to get what they want, they have to ask for help from third parties, may be online websites, browser add-ons or standalone desktop programs. It's easy to find a method, and even a free one. However, we always encounter unexpected problems. Following quotes are typical examples. "I need to convert some YouTube files. Problem is, I don't know a trustworthy site. I've used vidtomp3 in the past but ended up with a Trojan that was hell to get rid of, despite never clicking on the ads. So does anyone know a trustworthy site?" "I've been using the site video2mp3, but my antivirus has been blocking Trojan horses from the popups that keep coming up. Anyone know of a better one?" "youtube-mp3.org looks safe to me, except the ads, they are so intrusive. I think there are a lot of kids around there that just click the ringtone maker button and get stuck with a monthly payment of €16." WinX HD Video Converter Deluxe – Free download and convert any YouTube videos to MP3, FLAC, AAC, AC3 and other popular audio formats while keeping hi-fi sound. It is stable, clean and safe helping you achieve YouTube to MP3 conversion hassle-free. According to users' feedback and our testing, we find that many online YouTube to MP3 converters claimed free and safe don't work as advertised. Their interfaces are always filled with disturbing ads, popups, banners which are unsafe for work and kids. Some ads are even bundled with adware, malware, virus, Trojan and other unfriendly stuff. Even if you never hit it, your computer may be attacked. Besides, some online YouTube to MP3 converters put several Download buttons in a page, which makes users unable to pick out the right one to enable YouTube to MP3 download and conversion. Legitimacy of YouTube to MP3 is controversial. In technical terms, YouTube to MP3 conversion websites just help change the format from video to audio. From this perspective, it isn't illegal. While for musicians, it is believed as an act of infringing copyright and will reduce their revenues dramatically. Therefore, YouTube to MP3 sites (e.g. youtube-mp3.org) are unstable and may be forced to shut down all of a sudden. Latest update on September 6, 2017: YouTube-MP3.org agrees to shut down after getting sued by labels. As of now, YouTube-MP3.org is still technically live, but prompts an error "We are sorry, this service is not available from your jurisdiction." when we try to use it. Which Method is Free, Safe, Stable and Fast? As mentioned above, online YouTube to MP3 converters always come with ads, viruses, and the like. If you don't want to get your computer in trouble, you'd better switch to a great desktop program, for example WinX HD Video Converter Deluxe. This tool allows you to free download and convert YouTube videos to MP3 at one go. It is free from any adware, malware, virus and others, which can be proved by famous software download sites like CNET and Softonic. Another feature different from online services is that it will never be taken down. Last but not the least advantage is fast YouTube to MP3 conversion speed, because of the world's most advanced Intel QSV, MMX-SSE, Nvidia CUDA/NVENC, Hyper-threading and AMD 3DNow! Technologies applied. 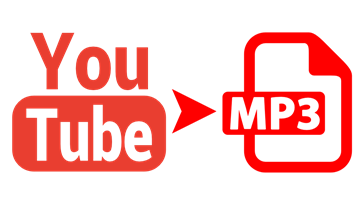 How to Free Download and Convert YouTube Videos to MP3 Safely? 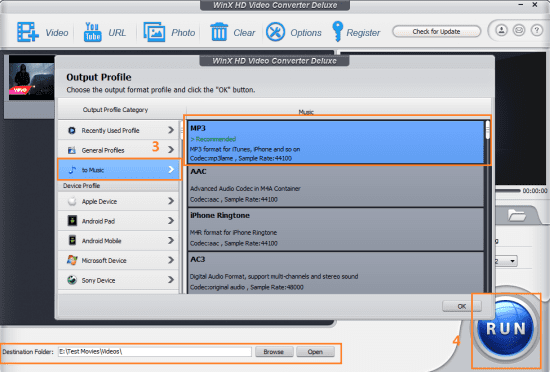 Above all, free download and install WinX HD Video Converter Deluxe or its Mac version onto your computer. Then launch it the moment you want to get mp3 from a YouTube video. Below is the start-to-finish guide. Step 1. Click "YouTube URL" in the top tool bar. Step 2. Paste the URL of target YouTube video into the text field and tap "Analyze" button. Alternatively, hit "Paste & Analyze" button to insert and analyze URL without a break. Seconds later, a list of available output options will be displayed. Simply choose your desired one. Then, make sure "Auto convert" button is ticked and click "OK" to move on. Step 3. From the auto pop-up Output Profile screen, navigate to "to Music" category, choose "MP3" and hit "OK". Seek for a Legal and Safe Way to Download YouTube to MP3? WinX HD Video Converter Deluxe Is Perfect Choice. • Quickly download and convert YouTube (music) videos to MP3, FLAC, AAC, AC3, M4A etc, with hi-fi sounds. • Free download videos from 300+ sites (Vimeo, Dailymotion, Vevo, MTV and more) besides YouTube and convert downloaded videos to audios. • Also available to convert local and online videos to MP4, AVI, WMV, MOV, FLV, WebM, iPhone, iPad, Android, Windows Phone, Surface Pro, Xbox, PS3/4 etc. Is KeepVid Down? How to Make It Work Well for Video Download?